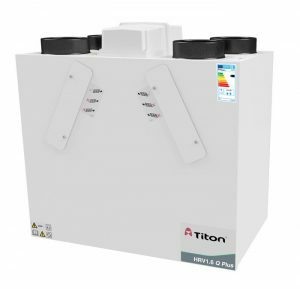 Titon has extended its range of MVHR units with the introduction of the new, ultra-compact HRV 1.6 Q Plus. Designed specifically for the modular construction market, the new high-performance unit measures just 600mm wide, enabling it to fit into tight spaces for easy installation and access. The new HRV 1.6 Q Plus combines low power consumption with a heat exchanger offering efficiencies up to 89%, which enhances SAP performance via Appendix Q. Furthermore, despite its compact size, the lightweight HRV 1.6 Q Plus can achieve excellent flow rates of up to 100 l/s or 359 m3/h, while the unit has also been independently tested by the BRE. Other benefits of the new unit include an extremely low specific fan power (SFP) of 0.49 W/l/s, as well as intelligent frost protection, with a stepped reduction of supply rates preventing freezing. The HRV1.6 Q Plus also has a fully adjustable boost overrun timer and Summer Mode facility built-in as standard. The HRV 1.6 Q Plus Eco version is available in ’Eco HMB’ and ’Eco B’ – each offering a 100% airflow diverting Summer Bypass, as recognised and listed in the UK Product Characteristics Database. There are additional intelligent humidity options available and units can be fitted with Titon’s auralite® status indicator or the new aura-tTM touchscreen controller, while Eco B models also have the option of the company’s auralite® status indicator, while Eco B models also have the option of the company’s auramode®, aurastat® andaura-tTM controllers. Available in the UK and Europe, the HRV 1.6 Q Plus range accepts 125mm ducting without the need for adapters, while also benefiting from independent fan adjustment and volt-free switching control. As with all Titon MVHR systems, the HRV 1.6 Q Plus is effective in reducing pollutants inside a property and improving indoor air quality (IAQ), in turn reducing the risk of Toxic Home Syndrome. The HRV 1.6 Q Plus is supplied with ISO Course 55% filters as standard (G3), with ISO Course 60% (G4) available as an option upon request. Units in the UK also come complete with a 3-year guarantee period. For more information please go to our HRV1.6 Q Plus product page.